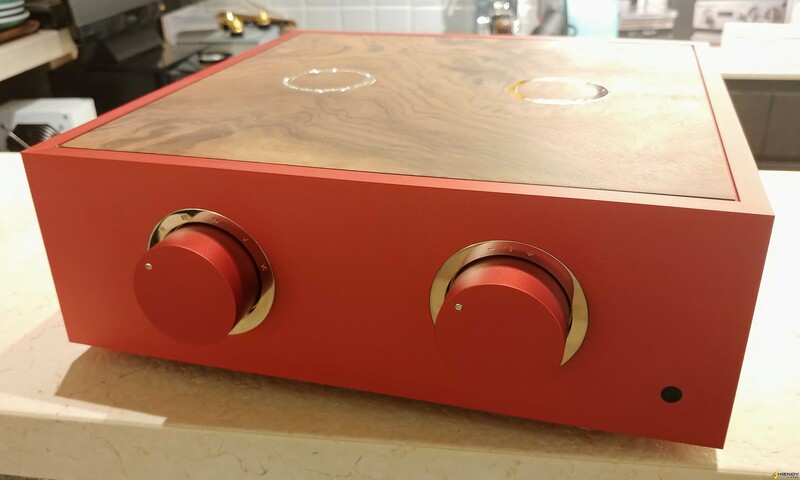 Bespoke Audio TVC Passive Preamp - An Unassuming Star | What's Best Audio and Video Forum. 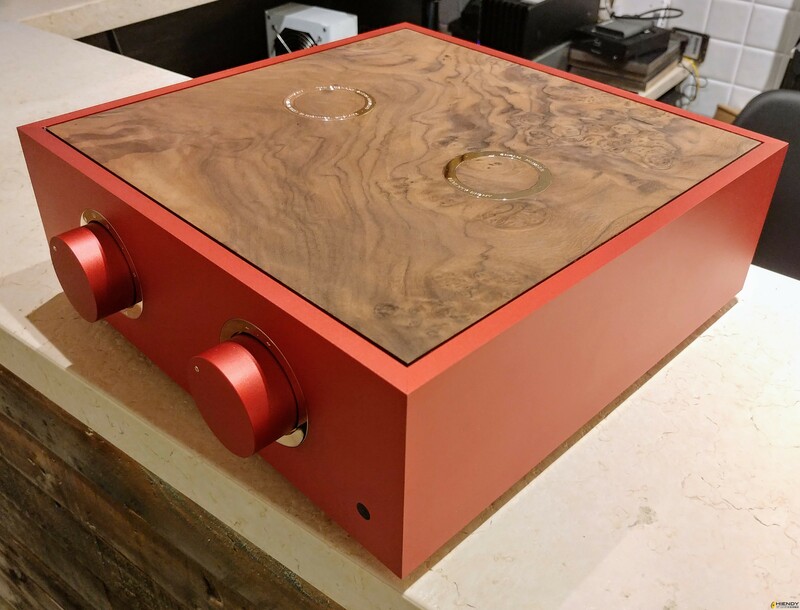 The Best High End Audio Forum on the planet! 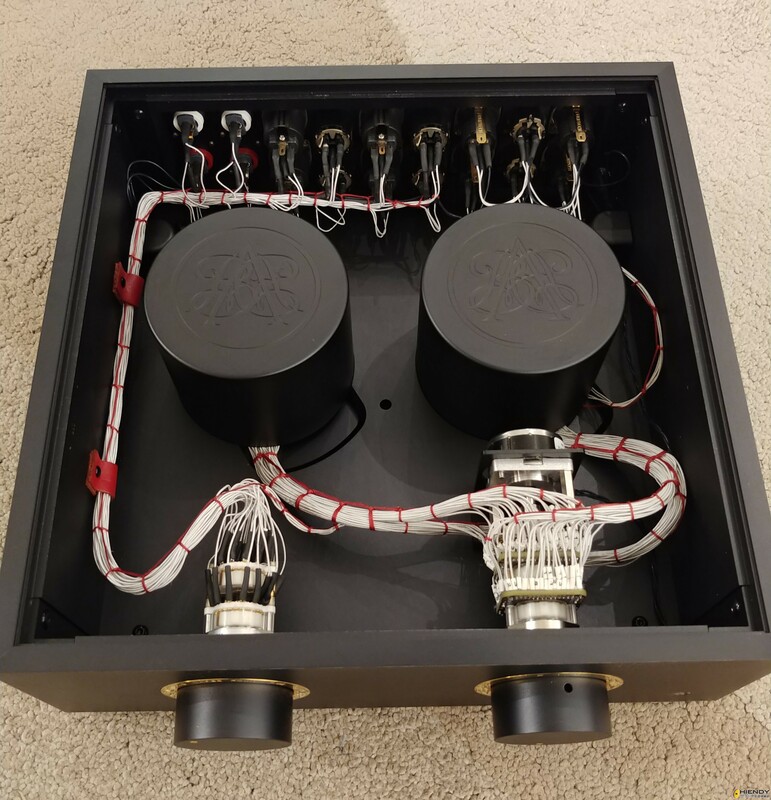 Do any of WBF members notice that I have switched from ARC 40th Anniversary Preamp to a Bespoke Audio TVC Passive Preamp (silver transformer version)? I did that about 1 year ago. Then why I post this thread so many months later? It's because I saw the following Bespoke at the Hong Kong dealer (Volent HK)'s showroom last week. The boss of Bespoke Audio is Mr. Harry O'Sullivan. He entertains nearly any requests from their clients. According to Ben Lau of Volent HK, this particular client went to a make-up counter in a department store and bought a lipstick of the red colour which he liked most. He then mailed the lipstick to Harry for matching the colour tone of the Bespoke preamp chassis ordered. Harry is so meticulous that even the screws holding the connectors at the back has the matching red colour. Red colour chassis is too loud for me. However I have some special requests for Harry too. 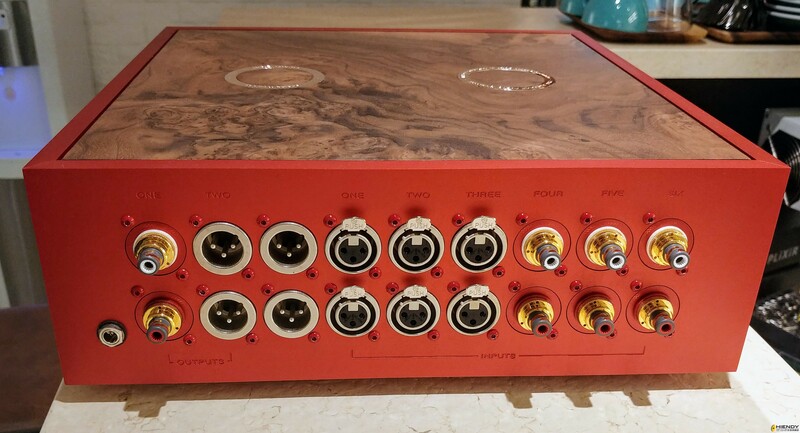 A Bespoke preamp can at most has 3 outputs and 6 inputs. The original connectors for a Silver Transformer Version are Neutrik silver xlr but I asked for installing Furutech rhodium and gold connectors too. For the rca inputs, I selected WBT NextGen one gold and one silver. During my 20+ years of audiophile journey, I owned/used many top active preamps : Spectrals, Gryphons, the past ARCs, ML 26S, ML 32 and the last one was ARC 40th Anniversary Preamp. The latter is definitely no slouch. I had also upgraded its tubes with very good NOS : 1950s blackplate 6550 and Russian military 6H30-DR. However when I home-trialed a Bespoke copper transformer version, I found that my ARC 40 could not surpass it in all aspects. I then took the plunge and bought the Bespoke silver transformer version. After a period of burn-in, I compared it with the ARC 40 in more details. The Bespoke Silver won easily in most areas, particularly in transparency, agility, micro-dynamics & resolution. The only slightly inferior aspect is in soundastage depth/layering which has been remedied by adding a Taiko Audio Setchi D3 active groundbox. After being sure of the comparison result, my ARC 40 was sold. Yes, passive preamps are not in the mainstream. Most audiophiles employ active preamps. However it's my experience that TVC or autoformer types of passive preamps if used in a suitable audio system, can fight easily with active preamps costing two times or more! And the Bespoke Audio passive preamps are the best in the class of passive preamps. IMHO they are Unassuming Stars! No idea how it sounds, as I didn't even open it. I think a decent resistor based volume control can equal a copper tvc but silver tvc is the best possible solution. The next preamp I build will use silver TVC + a tube buffered output. Passive pres are a good option but they depend on the source having a robust output section. Pls consider adding a switch on your coming silver tvc+buffer stage preamp so that the buffer stage can be switched off. IMO resistor type and LDR type passive preamps are usually benefited by a good buffer stage, otherwise they may become "too quiet". For tvc and autoformer type, this is not a must if the audio system is suitable. CKKeung, this is a very interesting post. What differences have you noticed between the Bespoke Copper Transformer version and the Bespoke Silver Transformer version? The list price of copper version is £ 9k. Silver transformer version adds £ 3k. IMO the silver version outperforms the copper version in most aspects, especially vividness, agility, extensions of frequency and resolution. However, around 25% of Bespoke owners prefer the copper version, saying that it has a warmer sound. The owner of Bespoke prefers the copper version as he hates working with silver wire! Is rather more fragile and prone to breakages which is rather frustrating when part way through winding 100 metres of the stuff. You and Harry/Lucy are friends or neighbours? Yes, fine silver wire is more difficult to work with. I guess the silver wires used by Besopke is of very good quality. It doesn't have the usual cool/clinical sound of silver in audio components. Charging an extra of £ 3k for the silver transformer version is not unreasonable. The internal wires of such a version are all silver wires. For some other brands, choosing silver instead of copper may need to pay double. BTW Harry just announced in the Bespoke website that the prices will have a rise starting from Feb 2019. Interested WBF members have to be quick for the audition/purchase! Hi Peter, Harry kindly brought around his beautifully made preamp for Blue58 and I to demo about two years ago. Dave, why would you combine a silver TVC with a tube buffer? If you're going to do an active preamp with buffer, why not use a resistor ladder or shunt type attenuator since they'd be lower in distortion than transformers? If you're going to do a TVC/AVC, why would you add a buffer? The TVC solves most impedance issues itself. PS as a curious side note, I recall that Bespoke uses copper hookup wire in their units with silver TVC windings. You might ask about silver hookup wire. All the hookup wires inside my Bespoke Silver are silver wires. You are right, after a period of burn-in and using, I now connect cables onto the original Neutrik silver xlr inputs/outputs of my Silver Bespoke. The sound seems to be the "rightest" this way. However, the Furutech gold and rhodium xlr connectors may be useful if I buy new cables in future. Oh ok, I am not recalling the wire correctly then. I don't have the Bespoke. I built a passive AVC line stage around the copper Slagle autoformer. It's essentially a DIY Emia, and probably very similar to the Bent Audio units that were built with AVCs (although some Bent were TVCs). I used Dave's D4 Zenwave wire as internal hookup wire, but used different types of connectors as mentioned above. I should mention that Pallen and I are huge TVC fans like Bazelio - we both have the Music First Baby Reference, not the all out assault in the Bespoke. We both feel it has beat a number of popular tube preamps. With a TVC the output depends on volume. This may or may not be a big deal depending on both source and what the TVC is driving. IMO a silver tvc is still the best volume control and loses less information vs others. I'm currently using LDR, and it's good but not as good. I don't want to go far OT, but afaik Thomas Mayer uses the silver slagleformer tvcs in some of his active pres. Maybe when I built the preamp I'll talk more about it... A lot of it is that I've built preamps and understand how to make an excellent tube buffer that sounds better vs not having the buffer. @DaveC In every attenuation scheme, output depends on volume. I don't know what you mean. We care about the voltage swing, current drive and impedance matching between source and amp. Impedance issues are ameliorated by a TVC in most cases with only the wimpiest of sources needing an active pre amplifier. The reflected load of the amp is cut in half for each 3dB of attenuation of a TVC. In most cases where you have sufficient system gain, the load becomes infinitesimal and you're left with the inductive reactance of the TVC - which for a Slagle AVC gapping is around 15k-20k. Even with a source output impedance as high as 3k (such as OTL phonos), this is working well. Bass is strong. Anyways, a TVC, silver or otherwise, is going to be higher in distortion than a shunt or ladder type stepped attenuator. Although, passive resistor attenuators can be problematic in terms of impedance issues for many chains. So my point is if you're going to build an active device which fixes impedance mismatches, then why not use the lowest distortion attenuator? There's no need for a TVC at that point, and all you're doing is further distorting the signal as compared to a simple resistor based attenuator. On the other hand, if you're going to build a passive device, then it makes sense to go for an AVC or TVC in order to avoid likely impedance issues. LDRs are a solution looking for a problem. They minimize mechanical contacts in the signal path. My friend pointed out, this is the same "problem" that TOSLINK solved. How well did that work? LOL. I just got done playing with LDRs myself, and quite honestly, once you buffer them they sound fine. But there again, once you're buffering, then there is no intuitive advantage of an LDR over regular resistors. But there are many disadvantages, like non-linearity, drift, etc. At the end of the day, a line stage should be a low noise, low distortion device. Passive TVC/AVC solutions solve the noise problem, and do reasonably well in terms of distortion at "consumer" signal levels for most of the frequency range. As soon as we go active, even by merely inserting a buffer, then we start fighting noise (and additional distortion). So if we're going to buffer, a tube doesn't seem like the best choice. Perhaps a low noise op amp like the OPA1611 configured as a voltage follower. It would best any tube any day in terms of noise and distortion. No, output doesn't depend on volume for every attenuation scheme. I don't think you're quite getting this. I disagree with a lot of what you say... especially on using an op amp vs tubes! ...but I don't want to discuss this in CKKeung's thread. Good luck with whatever you want to do... I've experimented a lot, built several preamps, etc... I know what I like and what I feel is best.